Loyal and devoted, the Pyrenean Shepherd loves its family and will want to be involved in all that they do. Highly intelligent, if trained well, this breed can learn how to do almost anything. They can be over-sensitive, however, so it is important that owners are consistent and positive when training. This is a breed that gets along very well with children; though training may be necessary to help control herding instincts directed at both children and other family pets. An excellent watchdog, the Pyrenean Shepherd will bark an alert whenever it feels the need should arrive and owners may have to train the dog not to bark quite so much. Socialization is important for this breed as they can be shy around strangers. Though the coat of this dog looks as though it would be a challenge for a novice groomer, the Pyrenean Shepherd is actually quite easy to groom. A quick lesson from your dogs breeder or a groomer should work for a lifetime. Avoid over-bathing this breed as it can ruin the coat. It is important that potential owners know that this breed requires off-leash exercise at least three times a week in order to work out its energy. Though this is a commonly healthy breed, there are some health concerns. The Pyrenean Shepherd has been known to suffer hip dysplasia, epilepsy, sub-luxated patella, patent ductus arteriosis or PDA, and progressive retinal atrophy or PRA. Both potential owners and breeders must work together to help weed these diseases out of the dogs. Potential owners should inquire thoroughly about any hereditary or genetic defects in the lineage of their puppy and report any diseases that develop to their breeder. Reputable breeders should remove these dogs from the breeding pool. Found high in the Pyrenees Mountains bordering France and Spain, the little Pyrenean Shepherd is found with its larger cousin the Great Pyrenees. A critical part of farming communities, even today, it is not uncommon to see the awkward pair guarding and herding the flocks as they have done for centuries. The Pyrenean Shepherd is a breed that has been around for thousands of years; they can be seen in Medieval artwork, straight down to the ear crop we see today. When sheep were imported to North America, several of the breed accompanied them. 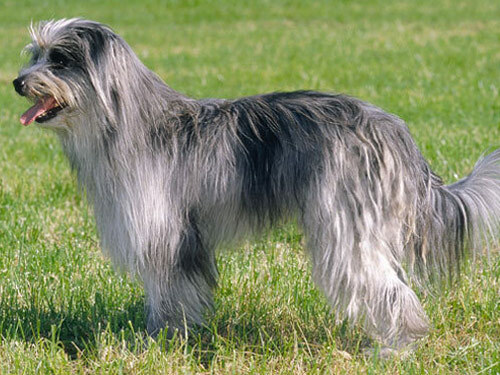 A breeding club was established for the Pyrenean Shepherd in 1987, and the breed continues to grow in popularity today.